Peanut Butter and Banana Breakfast Crepe | Naturally. There are many things I am realizing after purchasing the new IPad. This list is actually quite long and for time sake I will limit it to this: having food and recipes apps at my fingertips is awesome. This whole post was inspired by the Martha Stewart EveryDay Food Magazine App in which I was able to download last month’s issue for free. My new hope is that every magazine will jump on this I will no longer have stacks of unused magazines laying around my house. In this issue there was a section on crepes and the one that caught my eye happened to be a peanut butter and jelly roll-up. While I didn’t want to do this exactly, it got me thinking about how to incorporate peanut butter and crepes into a substantial breakfast. So I added in strawberries and a fresh banana puree and voila: Sunday breakfast crepes! I love crepes because they are light and so versatile. This breakfast reminds me of a good hearty waffle breakfast but is slightly lighter. Next time though I think I’ll make chocolate crepes because chocolate, peanut butter, and bananas happen to be one of my favorite flavor combos! To make crepes, combine all ingredients in a blender and puree the mixture until everything is well combined- about 30 seconds. (You can whisk the mixture but your batter may not be as smooth.) Let rest while you pre-heat an 8″ skillet over medium heat. Brush skillet with melted butter and add 1/4 cup of batter. Swirl around to cover the entire bottom of the pan and let cook until crepe begins to brown, about two minutes. Loosen the crepe with a spatula and flip with your fingers. Continue to cook crepe for another minute. Set aside and repeat with remaining crepe batter. Layer crepes on a plate. 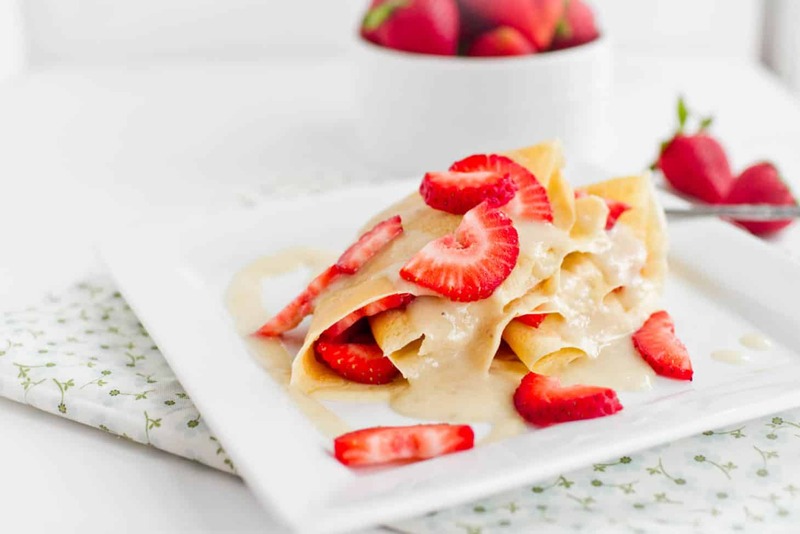 Any left over crepes can be stored separated by parchment paper and frozen in a freezer bag (recipe makes 8-8″ crepes). In a blender, combine banana and milk , pureeing until mixture is smooth. If sauce seems too thick, add a little extra milk. To assemble crepe, heat peanut butter slightly (just so it is easy to spread.) Take a crepe and spread peanut butter on half. Sprinkle Strawberries over the peanut butter and fold non-peanut butter side over, then over again. Repeat with remaining crepes. To serve, drizzle banana sauce and sprinkle with strawberries. If you want a little extra sweetness try putting a little honey in the banana sauce. This does look yummy, i cook crepes all the time and its nice to get great ideas. Ok, YUM. I just made crepes for the first time recently, although mine weren’t quite as nice looking as yours… but they were still delicious! And a peanut butter/banana sauce is about the best thing I could ever think of to add to a pile of crepes for breakfast/dessert! 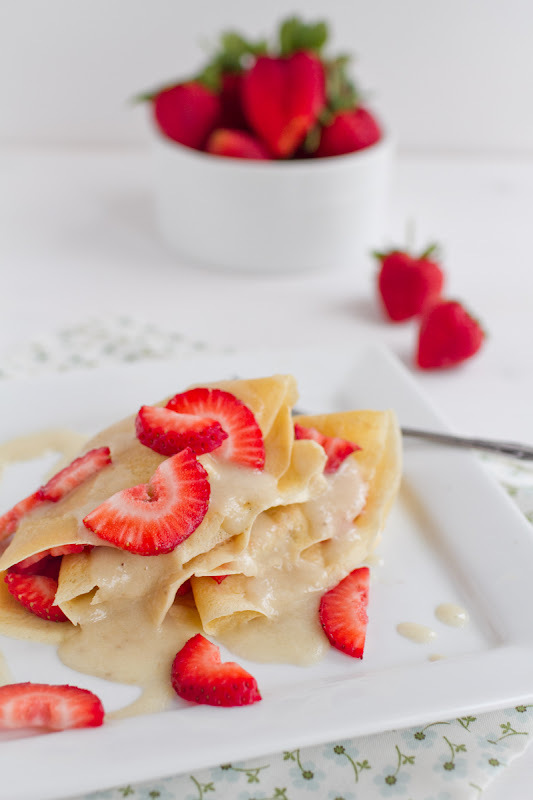 I adore crepes – but for some reason I haven’t made them since high school French class! These look incredible, and I love the combination of peanut butter, banana, and strawberries. I will be making these this weekend!! Can’t wait! Ohhh my! I need to make these asap!!! I love crepes!! They’re my favourite breakfast food and it’s always difficult finding tasty recipes. This recipe is phenomenal. I loved it and so did my family. Good job! I love this recipe! It’s delicious and easy to make! They taste better than the one in the crepe shop down the street. Thank you for sharing!!! !